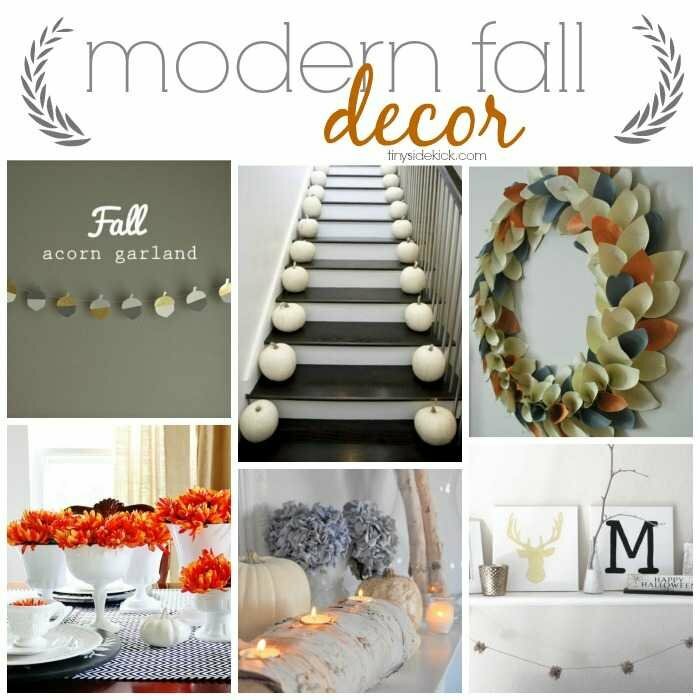 Inside: Great ideas to decorate your home for fall in a really modern way. So it is official. Next week is Thanksgiving and fall, at least in terms of holidays, will officially be over. If you’ve been out in public it seems like we’ve already been celebrating Christmas since August so I thought I’d give one last nod to Fall before it leaves us for real. If you follow my Fall Board on Pinterest, you’ve probably noticed that I’m drawn to modern fall decor and these were some of my favorites from the season. I love the simple colors and minimal fluff that all of these inspirations have. Like this Modern Acorn Garland from Oleander + Palm. Garland is one of my favorite things lately. Jeran got her inspiration from Paper Source and even includes a printable template in her tutorial so you can make a modern acorn garland too. I love the simplicity of this and the color pallet is perfect cause mixing metallics is the new black. White pumpkins were quite the rage this year, and displaying them up the stairs like this is beautiful. The contrast of the dark wood stairs with the pumpkins is so pretty and again so simple. I am just now starting to consider myself a wreath person because I’m realizing that there are so many ways to do a wreath. This modern fall wreath from Weird Little World on Etsy is right up my alley. I’ve been really into the blue and orange color combo this year and did both my fall tablescape and some string art in these colors. Speaking of tablescapes, I would love to dine at this fall table from Thistlewood Farms. The simple, yet poppy colors are so fun! And if I had a mantel, I’d love to do a simple fall mantel like this one that I found on Kim Power Style. The candle holder is so pretty! And last, but certainly not least is this fall mantel from Emerson Grey Designs that has so many great ideas all on one mantel. I mean really, she has a monogram, a silhouette, garland, a little bit of sparkle, and a natural element and yet keeps it so simple. So this is it. An official goodbye to fall and a hello to winter which I’m sure will bring on a bunch more fun ideas! You can see my favorite modern Christmas decor ideas in this post. I love that wreath! I still don’t consider myself a wreath person, but I love seeing how creative people are with them. Great picks! Love all of these! I feel like I am just becoming a wreath person too.